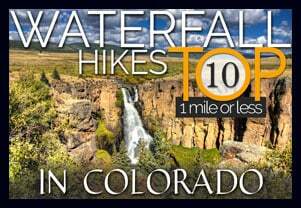 Along the way to The Pool or Fern Falls, you’ll run into this towering waypoint of nature in Rocky Mountain National Park, the Arch Rocks. These are boulders as huge as cottages where the trail passes through. 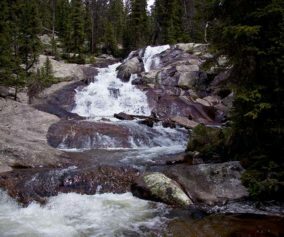 The trail is quite flat and hikers get to enjoy the sound of the running waters of the Big Thompson River. 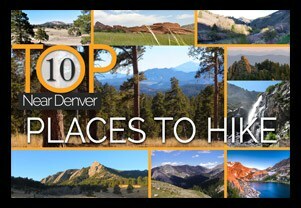 Explore the full Arch Rocks hike profile below for trail map, driving directions, and more of the details and tips you need to enjoy this adventure in Rocky Mountain National Park. 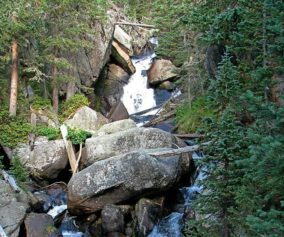 Parking is more limited in this area of Rocky Mountain National Park, and you’ll likely have to park at the Park & Ride then take the shuttle to the Fern Lake Trailhead. You’ll find driving directions above to The Fern Lake Trailhead (closest to this hike), the Fern Lake Bus Stop Parking area (very limited parking), and for the Park & Ride lot. 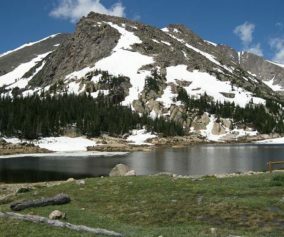 See the RMNP Shuttle page for dates and times of service. Avoid parking along Fern Lake road as this damages the road side. If you park or are dropped off at the Fern Lake Bus Station, the hike from the station to the trailhead will add and additional .8 mile, one-way, to your hike. 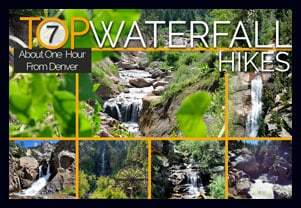 It’s a short destination hike along the Big Thomspson river to Arch Rocks. Arch Rocks was actually my very first destination on my very first hike in Rocky Mountain National Park in 2004. I camped at the backcountry site that is just a bit further up the trail, nestled back in the aspens and boulders that are so characteristic in this valley. At approx 1.5 mile a huge rock, the size of a house, arches over the trail. In centuries past, this rock sheered off from the towering cliffs above and tumbled down to this spot. It’s difficult to get a good photo of Arch Rocks and to really capture it’s size. If you can get down-trail, and a bit below it, you’ll have a better chance. 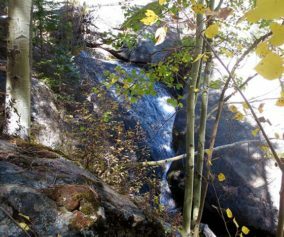 If you want to make your hike a bit longer, the next destination along the Fern Lake trail is The Pool–just .2 mile further–where Fern Creek and the Big Thompson River collide. 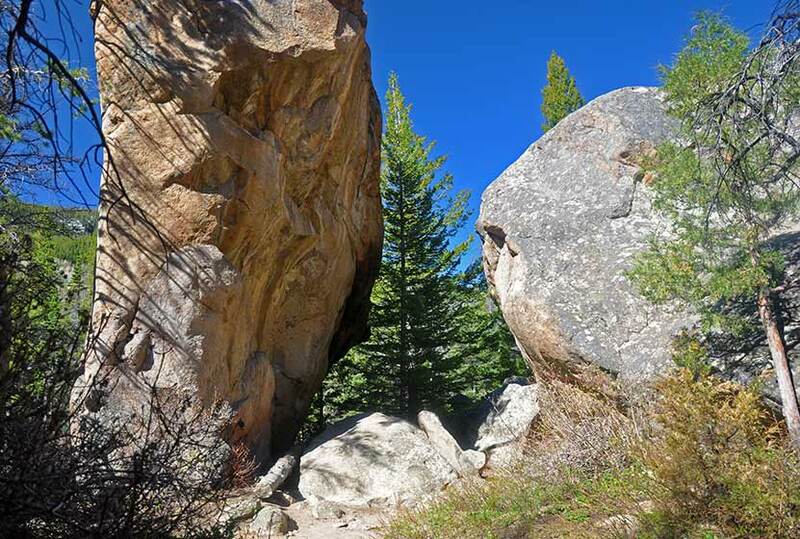 Bring some food: The rocks near the Big Thompson River can be a great place for picnics. Photo: We would like to express our gratitude to Charlie Stein for sharing such an amazing photograph of this hike to Arch Rocks in RMNP.